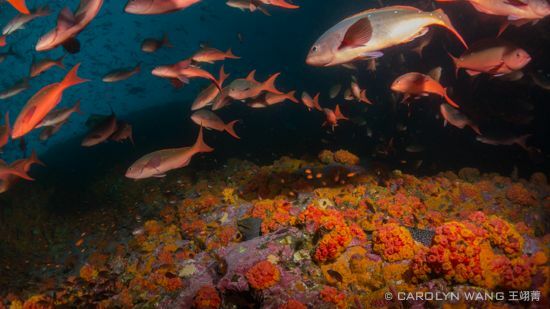 Most divers know of the great diving at Galapagos and Cocos Islands, but over 300 miles off the coast of Columbia lies Malpelo - a small island that a few have heard about. 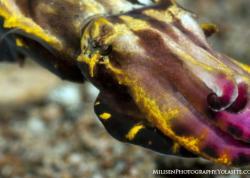 But while small in size, Malpelo offers some of the most exciting diving and big animal interactions in the world. 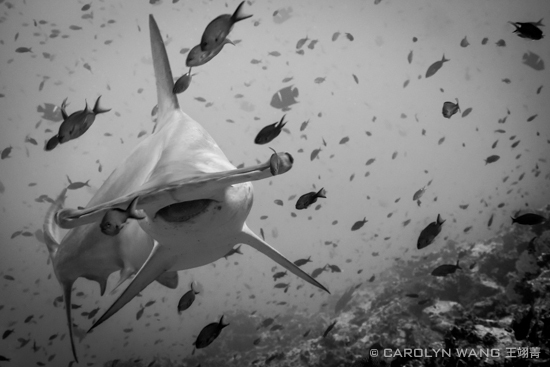 If you’ve ever seen photos of schools of hammerhead sharks, chances are the images were taken in the Eastern Pacific region. 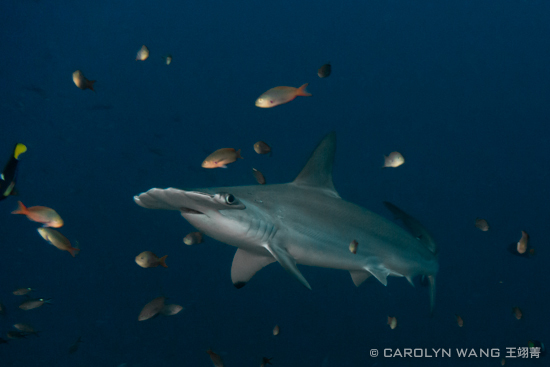 Schools of scalloped hammerhead sharks are known to migrate along routes that have been dubbed “shark super highways,” ranging between Galapagos, Cocos, and Malpelo. So it was here that I hoped I would finally get to see and photograph hammerheads. At first glance, Malpelo is probably not what comes to mind when you think about visiting an island. 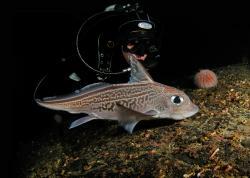 In truth, Malpelo is only about 1 mile in length, all unforgiving rock, with very sheer drop offs into the ocean. The island is uninhabited with the exception of birds and a handful of residents assigned to a very small Columbian military outpost that keeps watch for poachers. This wild and remote place has been deemed a UNESCO World Heritage site and there are strict limits on the number of divers allowed at any time. 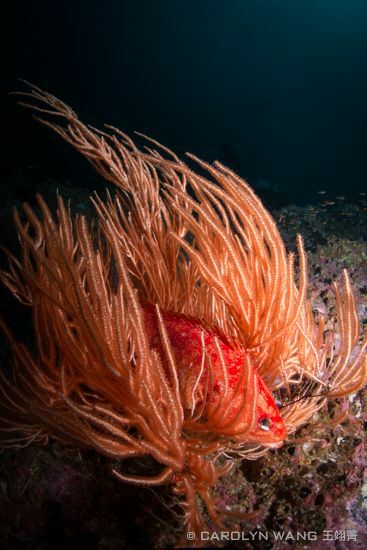 For divers and photographers, this is a huge benefit because it hasn’t been ‘over-dived’ and you have amazing opportunities to see a huge variety of life, all without running into tons of other divers. Malpelo is a destination that all wide-angle and big animal photographers should have on their wish list, particularly if you are seeking sharks. Malpelo is known to be frequented by schools of hammerhead sharks and Galapagos sharks, and depending on the season, you may also see schools of silky sharks, whale sharks, white tip reef sharks, mantas, and if you plan for it, a possibility of seeing the very rare smalltooth sand tiger shark. With all this in mind, I was very excited to join the Coiba Dive Expeditions trip on the Yemaya II live aboard last February to Malpelo. 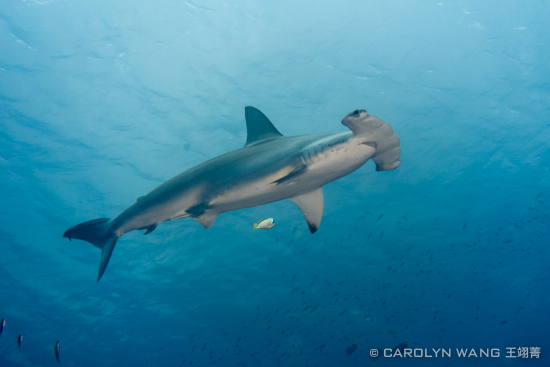 We had great travel and dive conditions and were fortunate to see scalloped hammerhead sharks on nearly every dive! For me, the trip highlights were schools of scalloped hammerhead sharks, Galapagos sharks, juvenile white tip reef sharks, free-swimming moray eels, eagle rays, massive scorpionfish, octopus, bustling cleaning stations, schools of jacks, pacific barracuda, leather bass and way too many other fishes to name. There were also many small fishes and critters resting on the reefs, but frankly, I was mostly focused on looking out into the blue for sharks. Here are some of my favorite photos from the trip… I hope you enjoy them as much as I enjoyed the diving! Scalloped Hammerhead Shark. Sony RX-100, Recsea Housing, ambient light, 1/100 sec, f4.5, ISO400. The hammerheads would approach low and near the reef, weaving side to side amongst the many fish at the cleaning station. Scalloped Hammerhead Sharks. Sony RX-100, Recsea Housing, UWL-04 lens, ambient light, 1/100 sec, f3.5 ISO400. Schools of hammerheads would circle around the cleaning station for many passes in the blue while a few would venture closer. 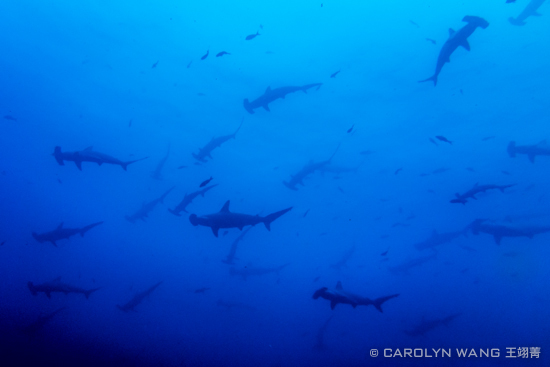 Galapagos Sharks & Scalloped Hammerhead Sharks. Sony RX-100, Recsea Housing, ambient light, 1/125 sec, f3.2, ISO400. 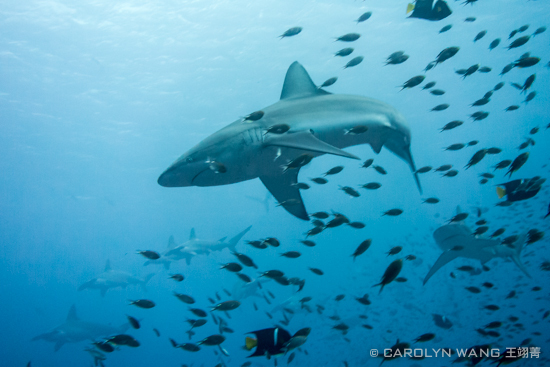 The Galapagos sharks traveled in a smaller group of around 8-10 and circled a spot on the northern corner of the cleaning station. Often you would see hammerheads also coming near them to be cleaned. Scalloped Hammerhead shark and cleaner fish. Sony RX-100, Recsea Housing, 2x Sea & Sea YS-D1 strobes – low power, 1/125 sec, f5.0, ISO400. Pacific Barracuda. Sony RX-100, UWL-04 wet lens, Recsea Housing, ambient light, 1/500 sec, f5.6, ISO200. 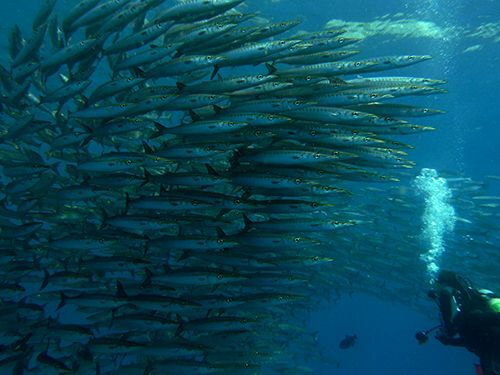 We encountered this large school of pacific barracuda every time we dove this site. Here one of the other divers photographs them from inside the school, pushing them towards me for this shot. Eagle Rays. Sony RX-100, Recsea Housing, UWL-04 lens, ambient light, 1/100 sec, f3.5, ISO400. Most of us are happy to see just one eagle ray on a dive. 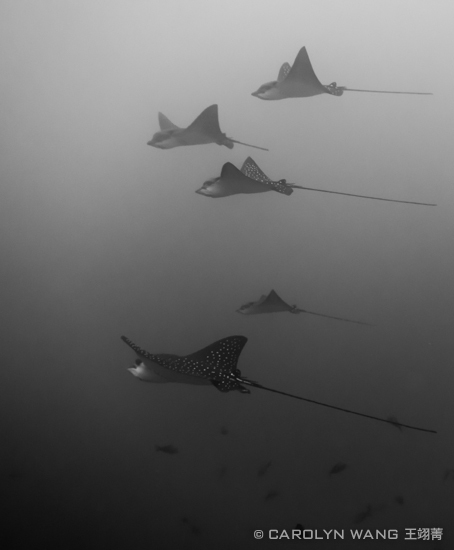 At Malpelo, these eagle rays traveled in a group of 5-8 over the course of our week of diving, and we saw them on every visit to the dive site. Moray Eels. Sony RX-100, UWL-04 wet lens, Recsea Housing, 2x Sea & Sea YS-D1 strobes, 1/800 sec, f5.6, ISO100. 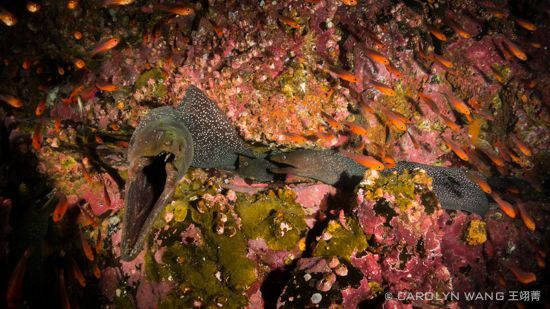 Eels were everywhere in Malpelo, even free-swimming during the day, and these three eels decided to share quarters in this crevice. You had to constantly pay attention to avoid accidentally getting too close to them while looking for sharks. Pacific Scorpionfish. Sony RX-100, UWL-04 wet lens, Recsea Housing, 2x Sea & Sea YS-D1 strobes, 1/800 sec, f5.6, ISO100. The scorpionfish at Malpelo were just massive. This one was at least 18 inches. Bigeye Trevally. Sony RX-100, UWL-04 wet lens, Recsea Housing, 2x Sea & Sea YS-D1 strobes, 1/80 sec, f6.3, ISO400. This school of jacks swirled around us for a several minutes and during our safety stop before moving on. Mating pairs often travel closely together and the males darken to almost black as seen here. Pacific Creolefish and Moray Eel. Sony RX-100, UWL-04 wet lens, Recsea Housing, 2x Sea & Sea YS-D1 strobes, 1/125 sec, f6.3, ISO200. Schools of creolefish swarmed over this colorful reef as a moray eel looks on. Blue and Gold Snappers. Sony RX-100, UWL-04 wet lens, Recsea Housing, 2x Sea & Sea YS-D1 strobes, 1/125 sec, f6.3, ISO200. 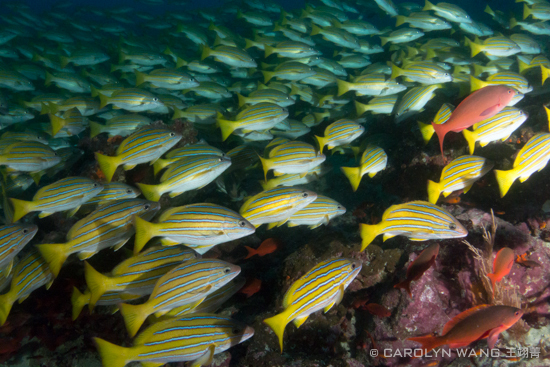 Huge schools of these snappers wove around hard corals on the reef. Leather Bass. Sony RX-100, UWL-04 wet lens, Recsea Housing, 2x Sea & Sea YS-D1 strobes, 1/100 sec, f7.1, ISO400. These large leather bass swam constantly against the strong current. 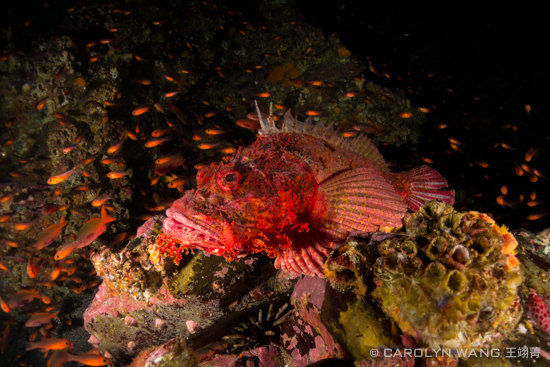 Pacific Scorpionfish. Sony RX-100, UWL-04 wet lens, Recsea Housing, 2x Sea & Sea YS-D1 strobes, 1/800 sec, f5.6, ISO100. 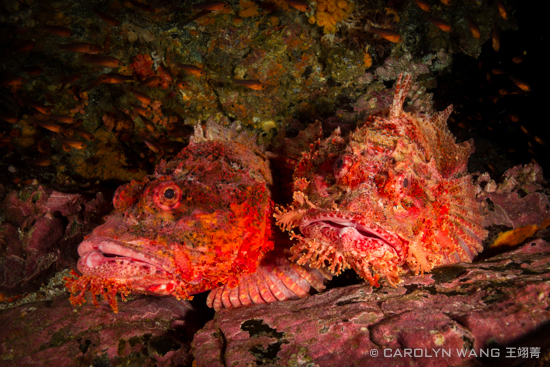 The scorpionfish on the left was resting until the fish on the right decided to cozy up next to it. 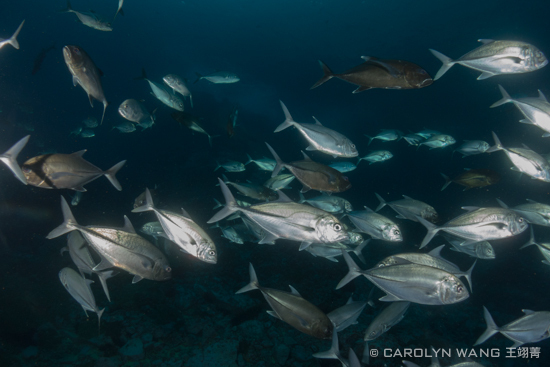 It was quite common to see more than one animal at a time at Malpelo. White Tip Reef Sharks. Sony RX-100, UWL-04 wet lens, Recsea Housing, 2x Sea & Sea YS-D1 strobes, 1/125 sec, f4.0, ISO400. Originally there was just one juvenile reef shark resting under this table coral formation and I held my camera rig down in the crevice, hoping for any shot as I couldn’t get in there to see and frame it. After a few shots, the second shark on the right squished itself in there, and you can see the disgruntled expression on the shark on the left’s face as it got shoved out of the way. Coral Hawkfish. Sony RX-100, UWL-04 wet lens, Recsea Housing, 2x Sea & Sea YS-D1 strobes, 1/500 sec, f5.6, ISO100. A quiet, peaceful moment. Scalloped Hammerhead Shark. Sony RX-100, Recsea Housing, 2x Sea & Sea YS-D1 strobes – low power, 1/125 sec, f3.2, ISO400. The equipment I used on this trip was the Sony RX-100 in a Recsea housing, UWL-04 wet lens on a quick adapter for fast removal/donning and dual Sea & Sea YS-D1 strobes. For compact shooters, having an ultra wide-angle fisheye lens will be great in situations where you are able to get closer to subjects, however for the shark portraits you’re often better off just using the native zoom lens on the camera. If you are shooting with a mirrorless or dSLR camera, I’d highly recommend you mainly use a wide-angle zoom lens for any shark shooting at Malpelo. The dSLR shooters on the trip found the full 180 degrees on a Tokina 10-17mm fisheye to be too wide for most of the interactions. 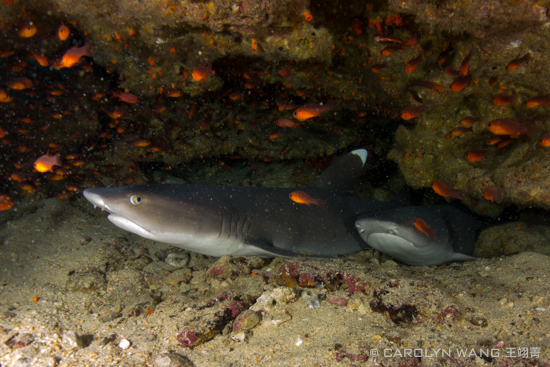 Try using your strobes on low power if the sharks are coming close enough for them to make a difference so you add a little light and color without blowing out their white underbellies. I found that because of the distance, often it was better to just shoot with ambient light. 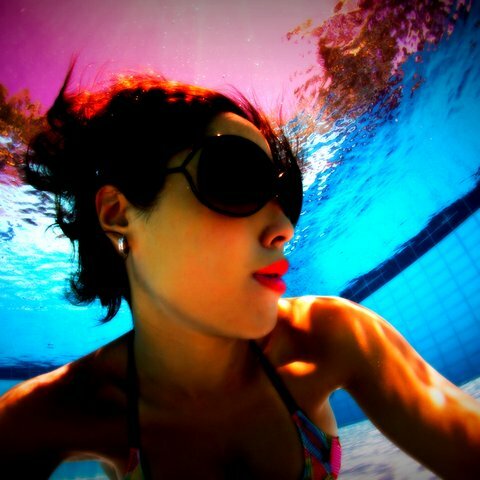 Irrespective of camera type, keep an eye on the thermocline and how it will affect your photos. 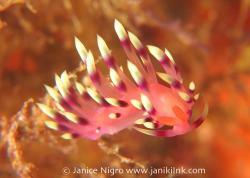 It was constantly moving shallower and deeper during the same dive at Malpelo and ranged anywhere from 40 to 80 ft. 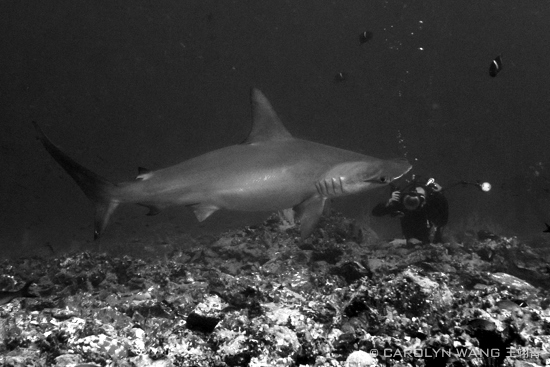 It was the cause of much frustration for all of us photographers because if the sharks happened to be above the thermocline and you below it, all of your shots taken through it would be blurred. 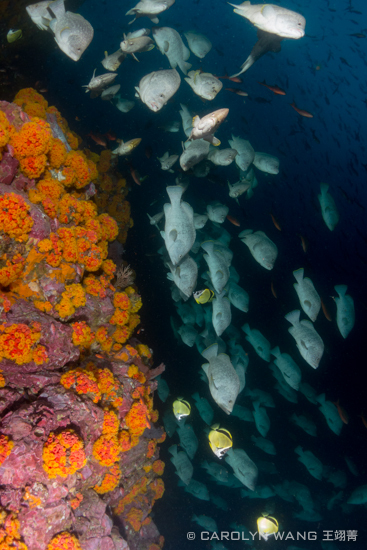 In terms of approach, the dive guides advised that it’s best to tuck down and essentially try to camouflage yourself as part of the rocky reef. If you swim towards the sharks or are up floating above the reef they tend to avoid you. So do yourself a favor and follow that advice to maximize your own photos opportunities and avoid being “that total idiot who chased away all the sharks” when you visit Malpelo! 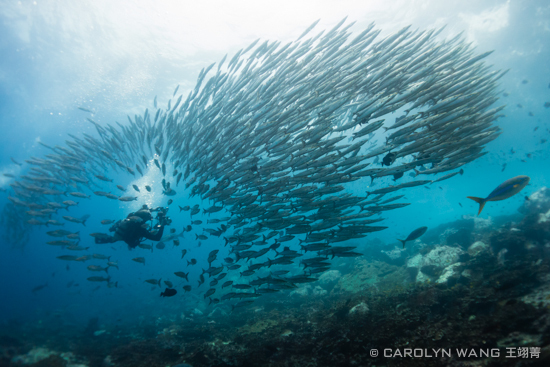 Carolyn Wang is video game marketing executive, PADI dive mistress, avid underwater photographer, and explorer for Bluewater Travel. She has a passion for diving with sharks and exploring unusual sites, and can often be found in California waters while plotting her next dive adventure abroad.